MPR: Is Randy Kelly really a Democrat? Randy Kelly and President Bush. Is Randy Kelly really a Democrat? Now that St. Paul voters have chosen Chris Coleman and Mayor Randy Kelly to face off in the general election in November, observers say one of the hottest questions in the race will be who's the better Democrat. Though party affiliation is not supposed to play a role in the election, leftover resentment from the 2004 presidential race could be turning the campaign into a litmus test for the 2006 and 2008 national elections. 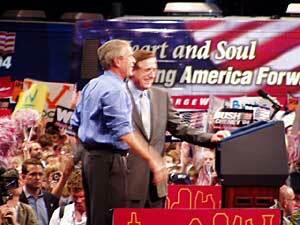 St. Paul, Minn. — DFL Mayor Randy Kelly's endorsement of George W. Bush for president in August 2004 caused a stir that hasn't died down yet. Kelly didn't seek the DFL endorsement last spring, and last week, the candidate who was endorsed by the DFL, Chris Coleman, beat the incumbent mayor by a two-to-one margin in the primary. Still, Kelly stands by his decision to endorse Bush. "As a mayor, you cannot afford to be partisan," he says, "because if you are to achieve great things for your city, you need federal partners and you need state partners." For example, Kelly says, his relationship with Republican Gov. Tim Pawlenty helped the city avoid a proposed $1 million cut in local government aid from the state. "When the special session was about to conclude, I called Gov. Pawlenty," Kelly says. "I said that we have rolled up our sleeves and that we had done everything to reduce costs, but I felt that it was appropriate to have some increase in local government aid. He said, 'well, mayor, you've done a good job. I will consider it.'" Kelly says that conversation resulted not just in avoiding the cut. In fact, the Legislature ended up increasing aid to the city by $6.5 million. Again with Pawlenty's help, Kelly reportedly raised $100,000 at a fundraiser for his re-election campaign. The event on Summit Avenue featured Pawlenty and Republican U.S. Senator Norm Coleman, St. Paul's former mayor. "This city is a DFL city. It's a Democratic city." Party loyalists say that fundraiser, and Kelly's Bush endorsement, cost him votes in the St. Paul primary. Stu Alger chairs the St. Paul DFL. "This city is a DFL city. It's a Democratic city," he says. "We've voted for Democrats for president, for senate, for governor. The Democrats do very well in this city. People identify strongly with Democratic candidates." Kelly represented parts of St. Paul as a DFLer in the state Legislature for over two decades before being elected mayor in 2001. He now finds himself in the position of having to prove his party credentials in a supposedly non-partisan race. Kelly insists he is a Democrat. "I come from a blue collar background, where all of my family has had to work very, very hard," Kelly says. "And such things as minimum wage, a decent workers compensation, unemployment compensation, the economic issues of government ensuring that there is a fair and level playing field for everyone is critically important. That's the reason I'm a Democrat. It's the reason I will continue to be a Democrat." Still Kelly is dogged by questions of party loyalty. Political scientist Dan Hoffrening says if Kelly's goal is to prove he's the better Democrat, he's facing an uphill battle. "Clearly, Randy Kelly, when he touts his record of holding the line on taxes is sounding a lot like a national Republican," he says. "Abortion is another issue that has been big in national races. Randy Kelly has touted his pro-life credentials, Chris Coleman has pushed his pro-choice credentials, and of course the bulls in the China shop, the big national forces in this race, are George Bush and John Kerry." John Kerry has endorsed Chris Coleman and is scheduled to come to St. Paul to campaign for him in October. And even before the primary election, Kelly had spent nearly $40,000 on a public relations firm with ties to President Bush's senior advisor and chief political strategist, Karl Rove. In last year's election, Kerry beat Bush in St. Paul with 60 percent of the vote. Political scientist Hoffrening says Kelly's Republican ties could haunt him as the race for St. Paul mayor gets more partisan. "Right now George Bush's approval rating at an all time low. So I think if Chris Coleman does defeat Randy Kelly, people will try to make some national inferences about this race and the health of the Republican ticket in both 2006 and 2008," he says. But for Kelly and Coleman 2005 is still the focus, and there are seven weeks of campaigning before the November 8 election.